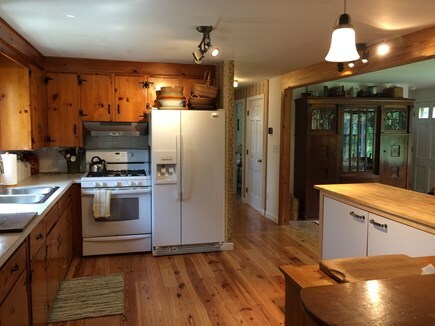 Spacious, sunny four bedroom classic Cape, beautifully situated on a dirt road in a secluded neighborhood in the woods. 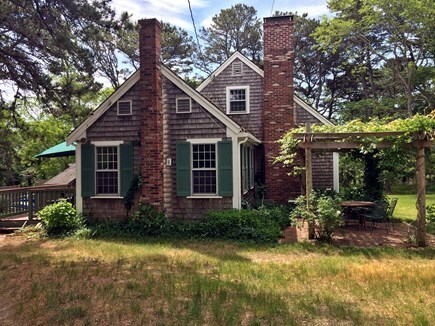 Convenient to Wellfleet's spectacular ocean and bay beaches, as well as its fresh water ponds, and just a short walk to the 800 acre Wellfleet Bay Wildlife Sanctuary and Cape Cod Bay. 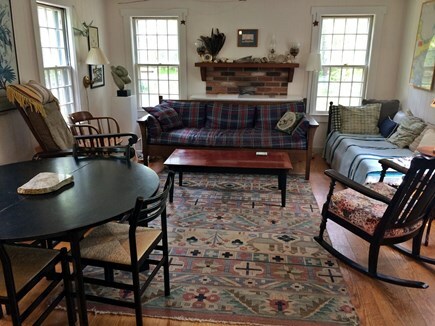 House is fully equipped and very comfortable -- perfect for family groups. Front patio/arbor has plantings all around -- a pleasant spot for outdoor lunch and dinner (with soft night lighting) -- looking out at the large front yard. A back deck, with gas grill, offers sun and seating for breakfast. Inside, the pine floored family room looks out on deck and patio and the front living room has a fireplace with picture window. 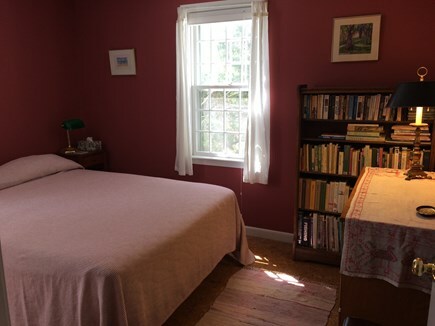 Also on the first floor -- a fully equipped kitchen, full bath off the hall and two pleasant bedrooms (both with queen-sized beds). 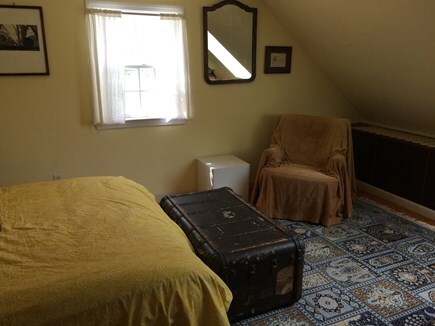 On the second floor, there's a master bedroom (with queen bed) and a large ''dorm'' bedroom with three twin beds. 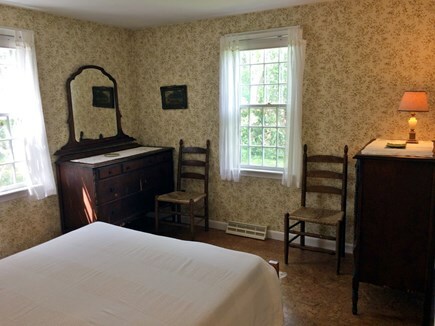 Both upstairs bedrooms have built-in bureaus and white pine floors. 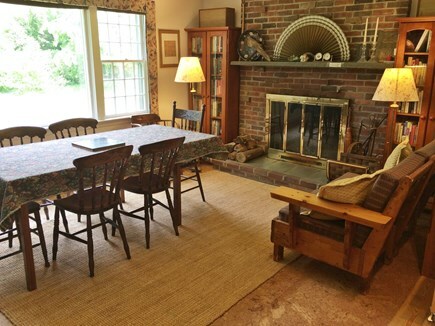 Though in a peaceful setting, the house is only minutes from swimming, sailing, surfing, fishing, windsurfing, hiking, golf, tennis, bike paths, art galleries, restaurants, live theatre, flea-market, drive-in movies, miniature golf, shopping, whale, bird and sunset watching. 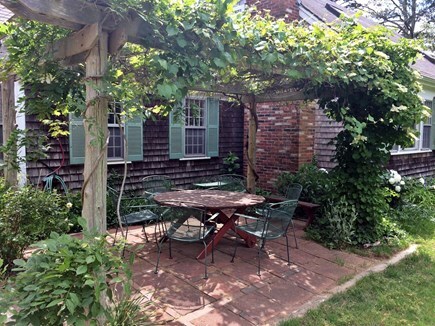 It's a fact -- Wellfleet is a bit of heaven on earth for vacationers who enjoy both relaxation and recreation. Additional pricing info: DISCOUNT FOR MULTIPLE WEEKS. State and local taxes of 12.45% will apply. Really enjoyed our family time at this lovely little place. Loved swimming and running and watching the turkeys fly into the trees! We loved Wellfleet and we'll surely be back. Thanks! 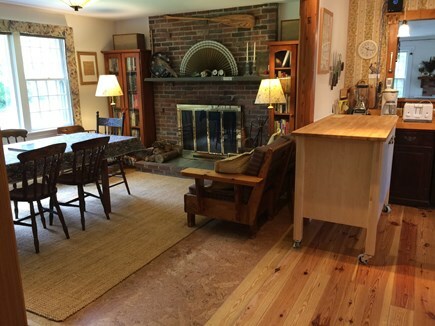 We had a lovely time in your beautiful house -- three generations and all sorts of fun. We loved our time exploring Wellfleet and the Outer Cape. 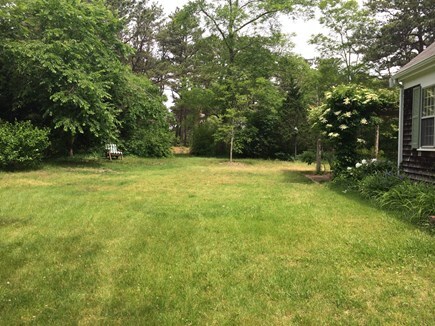 The yard is beautiful and the house is big enough that if anyone needed some quiet time, it was easy to find. We loved the fairy lights that welcomed us from our dinners out and helped us with our own late barbecues. What a haven you've created, we'll cherish our memories of Silver Spring! This was the perfect house for our two families. What a wonderful week in Wellfleet! Here are our highlights: Newcomb Hollow & Marconi beaches, Gull Pond, Provincelands bike trail, dinner at Mac's Shack, playing games, sitting under the grape arbor, the kids loved the bunk room (the adults did too!). Thanks so much! This was a wonderful vacation and a comfortable house to host some memorable gatherings of family and friends from far and wide. We are reminded that summers at the Cape all you really need is a swimsuit, one outfit and a raincoat "in case." Gorgeous weather, hot, only one rainy day out of the two weeks we were here. Enjoyed books and games, the grill and deck and I loved the outdoor shower. This week was amazing. 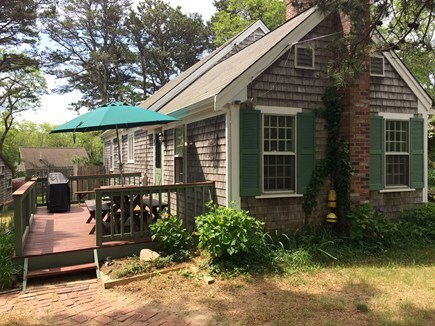 Wellfleet is definitely the place to stay in Cape Cod! Thanks and best wishes. Your home was the perfect canvas for my family to celebrate life and each other. We had an amazing week of laughs, joy and fun. Thank you! This house was perfect for our family vacation. We loved the grape arbor especially, and enjoyed raiding the games collection. Thank you! This place was the perfect location to check out everything the Cape has to offer! Thanks to the neat maps and all the guidebooks in this fully-stocked house we were able to take full advantage of awesome beaches, cute shops and delectable dinners. 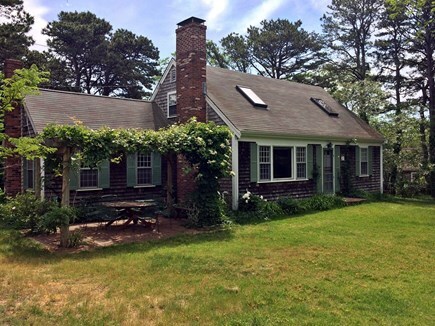 This place -- the house, the Cape, the ocean -- what a great time! We are already looking forward to next year and years to come. We had a fabulous time with this comfortable home as our base. From exploring the Cape and Boston to experiencing ocean, bay and pond beaches (don't forget to try the ponds -- the water is warm and gentle and the kids can play more easily), we made the most of our week here. We had fun cooking family meals in the well-stocked kitchen and loved the pergola outside. Thank you! Thank you for the great stay. We love the book collection and the little daybed in the corner, and the outdoor shower and the speakers in every room. All cozy & well-equipped!